At one point or another, we’ve all been guilty of being terrible packers. Over packing, under packing, last minute packers — the list of horrible habits goes on and on. To save you the fuss, we’ve gathered seven easy tips that will help make sure you have EVERYTHING you need the next time you go on a trip — nothing less and nothing more. Instead of starting your list with the obvious like clothes and shoes, start with the items you absolutely need to bring with you that wouldn’t be able to replace. Retainers, medication, work essentials, or sunscreen should be at the top of you list. 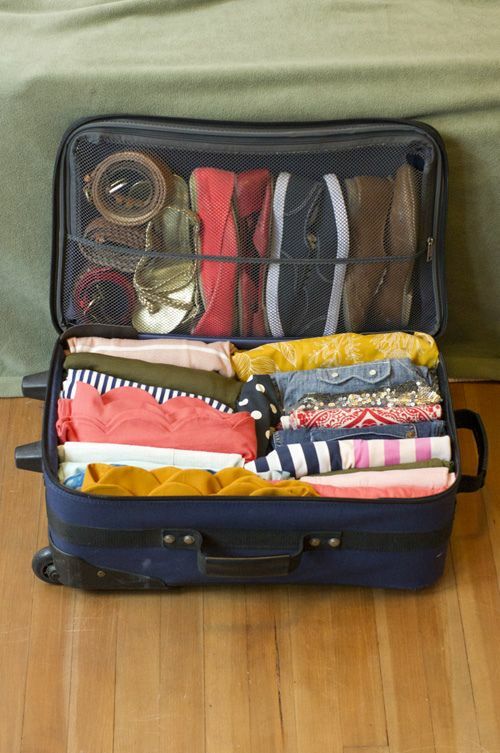 You can pack a lot of stuff into a small carry on size suitcase. After you’ve made your list, try fitting everything into your smaller suitcase. If it doesn’t fit, then go bigger. But always try to pick the smallest suitcase you can. It will keep things organized and you'll know exactly what you have and where it is. Instead of folding your clothing like you do at home, try rolling it instead. You’ll find you have lots of extra space for the rest of your stuff, and your clothes won't be rinkled! Shoes take up a lot of space, so try cutting down. If you’re heading south and you know you’ll be at the beach all day, bring flip flops or slides! If you’re going travelling to a city, you’ll need a pair of heels and some good shoes to walk in. Limit your shoe quantity and I promise you will thank me later. If you’re going to be doing work while you’re away, I suggest keeping all of your business items in one place, and all of your leisure items in another. For example, pack your laptop, camera, business cards, or anything else that involves business into your carry on. That way, if your luggage gets lots or delayed, you'll have all the important things with you. A full suitcase can be ricky, especially if you’re travelling by plane. Your suitcase will always be neater on the way to your destination, so if it’s already to capacity when you leave, there’s a good chance you’ll have a hard time organizing it on the way back. Make sure you leave space for shopping purposes and last minute packing situation such as flight changes or emergencies. Instead of bringing full size bottles of shampoo, conditioner, or other toiletries with you, invest in some mini plastic bottles and take your favourite products with you. No need to buy travel sized items, or leave your favourite products at home! This will also help prevent suitcase product spills.